At a press conference this morning the line up for the Venice Film Festival was unveiled. 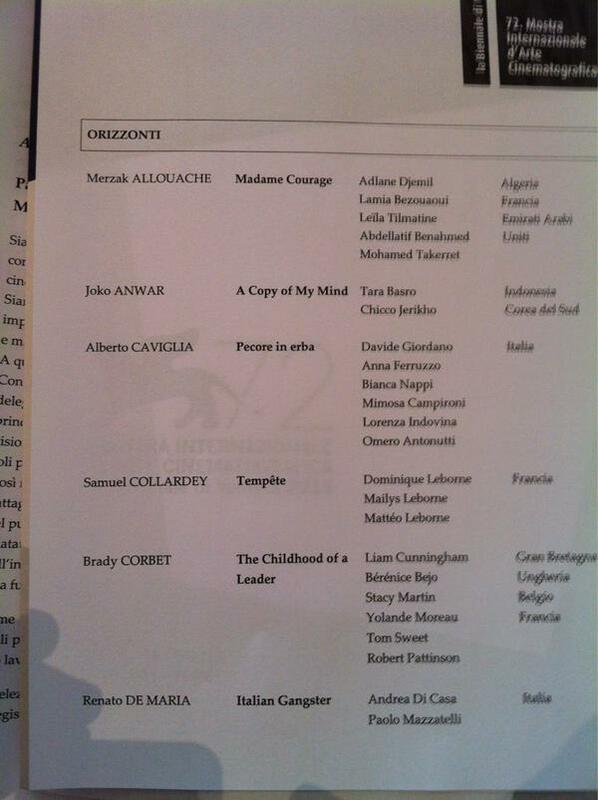 Italian Movie Site LinkinMovies.it tweeted this pic from the Venice film Festival programme which shows 'The Childhood Of A Leader' listed under the 'Horizons' section of the programme. The full Horizons/ Orizzonti line up can be seen HERE on the official Venice Website. "The international competition for a maximum of 20 films , dedicated to films that are representative of new trends in world cinema aesthetic and expressive , with a focus on the beginnings , emerging authors and not yet fully established , films from smaller , lesser-known , but also works that measure up genres and current production with intent innovation and creative originality . Within the Horizons section it houses a competitive selection of short films up to 20 minutes, chosen according to criteria of quality and originality linguistic expression. Are eligible for selection only feature films and short films presented at the show premiered ." The 72nd Venice International Film Festival takes place Sept. 2-12. We'll update with anymore info/news as it comes out!